I am in access and need to update the Inventory I have made a table that contains the adjustments. (Thousands of them) In your notes about InventoryAdjustmentLine, it states that I must be in single user mode to do this. What is the connection string that I must use? When I connect in QuickBooks I currently log in as administrator and auto connect to access. QODBC uses QuickBooks SDK to communicate with QuickBooks Company file. QODBC can perform only that operation which is available via QBSDK. There is no option/function that will change QuickBooks company to switch the company file to the single user or multi-user access. 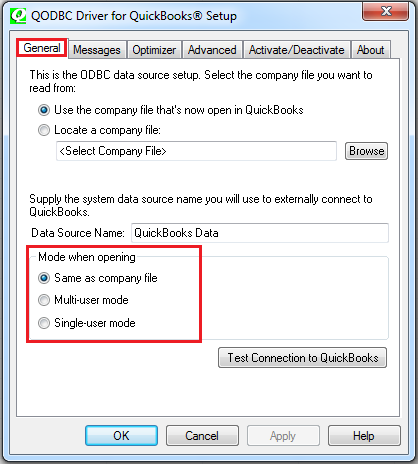 Yes, If no one is using the QuickBooks company file, you may connect to QuickBooks Company file as "Single user mode" or "Multi-user mode". You may either use Connection string or specify OpenMode = F (Follow Company) / M (Multi-user) / S (Single-user) or Change the File Open Mode from QODBC Setup Screen.